Son Muntaner is one of three 18-hole layouts at the Arabella Golf and Spa Resort in Palma, Mallorca. Son Vida is the senior of the three courses, constructed by Fred Hawtree in 1964, followed by Son Muntaner in 2001. Finally the Ramón Espinosa-designed Son Quint was opened in 2007. Kurt Rossknecht has been the architect behind many of the top courses in Germany for a long time now (Motzener See, Gut Thailing and Am Alten Fliess spring to mind) and he not only laid out the 18 holes at Son Muntaner in 2001, he also upgraded the neighbouring Son Vida course at the same time. The course measures a whopping 7,000 yards from the back markers, with a par of 72. Surprisingly lush for a Mediterranean layout, it is routed over rolling terrain in two loops of nine, with ponds coming into play at several of the holes on the front nine. Stone dykes have been incorporated into the design (the par four 10th features a delightful ha-ha wall) and many of the greens are pleasantly hourglass-shaped. 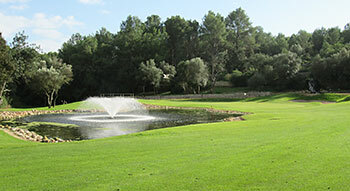 Another round at Muntaner, the premier course at the Arabella resort close to Palma. I first played here back in November 2016 (player review below dated 28/12/16) and this was just after some major work on the course to burn the old grass off and replace with Bermuda. I wrote then that the course was not ready for play, even though it was open, so it was important to see the course again and to assess progress and to see how the new grass has settled. Very happy to report that the course is looking good, the new grasses are maturing nicely and plenty of strong presentation all around. I did mention a few of my favourite holes on the earlier review and here I’ll cover a few more; the 6th is a tough par-4 and a good looking hole – an elevated tee to a dog-leg to the right, with decent bunkering on both left and right of the fairway, add in some water further right on the elbow and a stroke index of 5 is obvious – the approach to the green is a little uphill too. Another hole I like is the 10th; two areas of fairway that are separated by an old wall, a heavily bunkered slim green awaits around 130 yards from the wall. I’ll gloss over the 11th, just to say still not a hole that I like and it needs a re-think. I always like short par-4’s, especially the good looking ones; the 14th hole at around 330 yards is very good indeed – the sensible play is to hit to around 200 yards from the tee and then attack the green – a tough green too, water on three sides and bunkers on the remaining side. Great to have played the course again and also managed to play on Arabella’s second course, (of three) Son Vida too, not quite as good as Muntaner but great fun. I am a fan of Mallorca especially the Palma area and the Sheraton Hotel at the Arabella resort is a perfect place to stay for golf and much more. Feel it is appropriate to come back with another review on Son Muntaner after the course was completely regrassed in 2016 and holes 5 and 6 rerouted back to their original design. First, both changes are clearly for the better. Conditioning is one step up on the previous situation now that the grow-in phase is complete (unlike the situation last year which Alex refers to) and the new Bermuda grass has been firmly established. It is great to see that they are able and willing to maintain the course in a drier, firmer condition than before. For me, Son Muntaner is now clearly in the top five on the island. Value-for-money is still a big issue (the standard high-season guest rate at €150 is not competitive as Son Gual costs less and still is a lot better). Pace of play can also be a problem, but if you know when and with whom to play (members can apparently buy a limited number of tickets for €50...) it gets an unequivocal thumbs up, albeit clearly below Son Gual and Alcanada. I agree with the most recent review (April ’16) for the course, this doesn’t feel like the #3 course on the island. In saying that there has been big changes recently and the course has been closed for around five months. The old grass has been burnt off and has been over seeded with new Bermuda and the course re-opened in late October 2016. Playing in mid-November, it was clear that the course has been re-opened far too early – I understand the need to generate green fee revenue but the course was not ready in November. I worry that opening ahead of time may cause issues that could be avoided. Current conditions aside, the design is pretty good with a number of strong holes; starting at the opener. An elevated tee to a dog-legging to the right fairway with sand and water trouble short and left of the green – a good start. The 2nd and 3rd holes are little ‘up and down’ ; the 2nd is long par-5 with a very slim fairway and water on the right and then the par-4 3rd comes back with the water on the right again – so watch the cut tee shot on both holes. The 4th is my favourite hole in the first few – here is a big par-4 with great bunkering at landing point and a barranca to cross around 80 yards short of the long green. The best looking par-3 on the front nine comes at the 7th – a mid-iron, downhill and a tree amphitheatre. The (stronger) back 9 starts with a long par-4 with an old wall crossing the fairway at driving point – nice to see. Not a big fan of the par-3 11th as it is just too long – close to 250 yards and will need your Sunday best to get close to the green. The 13th is the next par-3 and so much better, 150 yards at most, slightly uphill and with trees behind, strong bunkering and a step in the green makes this probably the best short hole at Son Muntaner. The 15th and 16th holes are par-5’s – both obviously have the length but what I like about the holes is the bunkering at the greens and also more bunkering around 60 yards short – these are made to catch many second shots for the better players trying to hit the green from way back. The final hole is strong; around 400 yards with a drive coming out of a funnel of trees (think 18th at Augusta National) to a narrowing fairway; the approach is slightly uphill to a long green, pointing slightly right, with bunkers in just the right spot (short and right) – this hole is certainly one of the best on the course. Son Muntaner’s clubhouse is in the perfect position above the 9th and 18th greens and a great place to eat and drink. The course is worth a visit but as I said earlier, I worry that the course condition will be an issue – I hope not and will take another look in a couple of years … 3rd on Mallorca? probably not for me – I think I would have Puntiro (to the east of Palma) ahead, although it was around five years since I was last there. Why is this course ranked no 3 on the island? It certainly gets a lot of play as both hotel guests and members have a choice between Son Vida, Son Muntaner and Son Quint and there is no contest there. But is it worth the 120-odd euro greenfee for the rest of us who belong to neither category? No way! Not even by Mallorcan standards (mediocre courses priced as championship layouts elsewhere) can it ever be regarded as value for money. I would rather play Alcanada or Son Gual for the same money or play Puntiró for quite a bit less. All those courses are better than Son Muntaner in my opinion. Having warmed up yesterday at the Arabella resort’s Son Quint and Son Vida courses, it was time to take on the Son Muntaner course today. Water features on the opening three holes, with a pond to the left and behind the opening hole, followed by an artificial stream that separates the 2nd and 3rd fairways. On paper, looking at the course guide before I played, I thought I’d hate those holes, especially 2 and 3, but they work rather well as the water course has been set out rather skilfully and there’s plenty of width to the holes so you really have no excuse if your ball ends up wet. The par three 5th and short par four 6th were a bit of a disappointment as they’re really just temporary holes at the moment, until two exciting replacements are brought into play next year. Land that was earmarked for a hotel development is now being brought into use and a small lake will come into play when the new fairways have grown in. On the back nine, I loved the old wall that cuts across the 10th fairway and having to find a way round the 1,000 year old olive tree “Na Capitana” that sits in the middle of the 15th fairway. The hole that precedes this one, the left doglegged 14th is probably the best hole on the inward half, played to a green that’s protected by a very attractive pond to the front left side of the putting surface. I understand the course will close for part of next year when it’s being completely overseeded with new Bermuda grass so it’s really still a work in progress at the moment. It’ll be interesting to see how the newly renovated Son Muntaner looks at this time next year. Jim McCann. One of 3 courses within the Arabella Group. From my point of view the most challenging of the three with almost 6300 m from the back tees.Boasts some magnificent holes like (2, 3, 4, 8, 14, 15). Some of them are really though to play like the par 5 8th and the par 5 15th - really narrow from the white tee.Unfortunately during my visit the fairways on hole 15 and 16 were completely under repair. I would also like to remind the tourist players to take a little bit care of the course and replace divots and repair pitch marks, because it seemed to me I was one of few who was repairing pitchmarks on the greens.If you play in Mallorca this is a good choice just 10 minutes outside of Palma and you have two hotels from the Starwood group in the vincinity that offer a complimentary shuttle bus also to the two other courses Son Vida and Son Quint. Have played several different times and is a very enjoyable course with some nice quirky factors. Was in excellent condition recently despite much rain. Easily the best course of the Arabella trio. unfortunately, in Febr. , 2013 greenkeeping cannot match the excellent layout. Larger grass free patches around the very soft thus unpleasant greens are not the standard you expect at a course of this quality. 4 Stars from me at most. We played Son Muntaner after a round at the sister course Son Vida and this was a different class of course. The course was in fantastic condition, a range of tee boxes made for a good but fair challenge regardless of your standard and from the moment we arrived the whole place oozed class. Clearly a lot of though had gone into making this a full golfing experience and it was a pleasure to play. There were no massively memorable holes but water had been used on a handful of holes intelligently and the ha ha on the 10th was definitely a nice feature. Well worth playing if in the area.